Born at Toronto, Ontario on 15 April 1851, son of James Campbell and Mary Sower, he was educated at public schools and model school of Toronto. He operated a grocery business in Toronto from 1868 to 1875 then at Eglinton, Ontario from 1875 to 1881. He came to Winnipeg in 1881 and, the next year, established the grocery business of Sutherland & Campbell. In 1890, with R. R. Wilson and his brothers A. 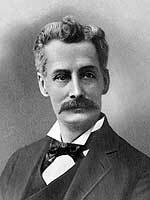 B. Campbell, Charles Campbell and W. J. Campbell, he founded the wholesale grocery brokerage company of Campbell Brothers & Wilson Limited. It eventually had branches in Calgary, Lethbridge, Red Deer, Edmonton, Regina, Swift Current, Saskatoon, and Vancouver. He served as a Director of the Canadian Fire Insurance Company, the Home Investment Company, and the Anchor Wire Fence Company. For many years he was chairman of the City of Winnipeg Sinking Fund and Trustee Board. In 1904, he married Sarah S. Cottingham of Toronto. He was a member of the Manitoba Club, Commercial Travellers Club, Canadian Club, St. Andrew’s Society, AF & AM, and IOOF. Address: 85 Kennedy Street, Winnipeg. He retired from the business and moved to England in 1912. He died suddenly at his home at Finchley, London, England on 14 April 1925. His body was returned to Canada for burial in the family plot in Toronto.